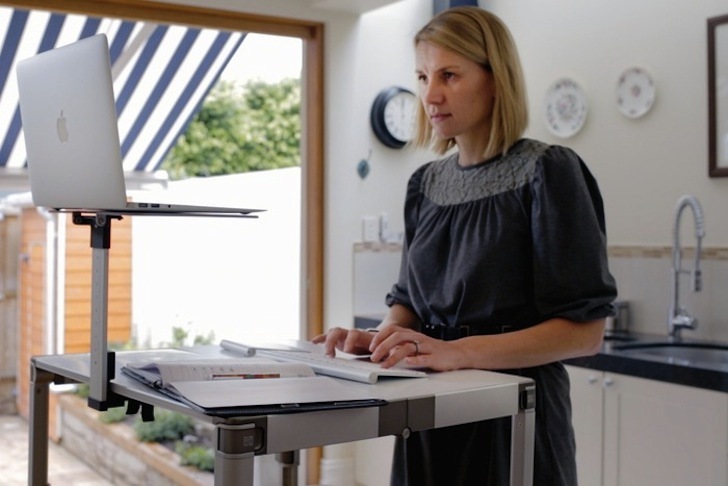 If you’re in the market for a chic, portable standing desk, look no further than the ZestDesk – an adjustable device that turns any table into a standing desk. Created by Peter and James Moore, the ZestDesk neatly folds down into a carrying case with a handle, making it an ideal space-saving solution for those who hot desk or work from a shared table. The popular product is already funded on Kickstarter, but it’s not too late to get your own–ZestDesk is still taking product orders and expects to deliver its first shipment next April. So basically a $300 "high chair" for my existing desk? Yeaaaahh. If you're in the market for a chic, portable standing desk, look no further than the ZestDesk - an adjustable device that turns any table into a standing desk. Created by Peter and James Moore, the ZestDesk neatly folds down into a carrying case with a handle, making it an ideal space-saving solution for those who hot desk or work from a shared table. The popular product is already funded on Kickstarter, but it’s not too late to get your own--ZestDesk is still taking product orders and expects to deliver its first shipment next April.